Finito! Click for my insufferable braggadocio! Sidebar: For those who don’t know, my daughter is mildly autistic. That’s what makes me hopeful and happy about this story. My cousin and his family called earlier to tell us they’d be setting off a vinegar and baking soda bottle rocket and releasing a couple of mice in the field across from our house, and they asked if we wanted to come. My daughter had a long day and didn’t want to bestir herself from her couch, but I told her I was going, and then she wanted to come because I was. Holy moly! A spontaneous thank you! And an understanding that in this situation, it was appropriate to thank someone who has invited you to do something with them! And a sentence telling them WHY you’re saying thank you! What a wonderful display of social awareness and concern. I’m ecstatic. This is just wonderful! Zoo trip, Jarritos, and socks. I say “truffles” to you, sir! Good day! At last, they’ve released the perfect board game for me. Enemy Chocolatier! What could be better than a strategy board game that revolves around chocolate? And for six bucks? Bliss. This is going on my mental wish list. Cheapass Games, I love you! Apparently, I’m the Emma Goldman of the blogging set. You have finished the test! You scored 84. Are you impressed? Just like that freaky, bald girl in The Matrix, you have the ability to see beyond what other people see and realize that there is more to life, people, and situations than what meets the eye. You are a true Free Thinker/Open-Minded/Outside-of-the-Box person. Stay true to truth and you will always be free. Rather than buy new Tupperware bits to store my daughter’s plastic toys in, I’m selling some yarn to consolidate storage. It’s good quality stuff, so go here, my pretties, and buy! Buy! Today I realized that I know how to play all the chords for the chorus to Hero of Canton (The Man They Call Jayne) on my grandmother’s guitar. I got quite excited, even as I realized just how geeky that was. Now I want to learn all the rest of the chords for the song. I can pick and strum “Wildwood Flower” (mostly haltingly) but that’s only got three or four chords, so it’s not exactly rocket science. 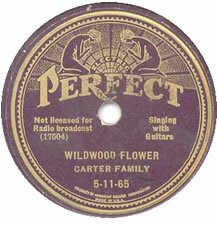 I love the song “Wildwood Flower,” which you can hear here, and used to drive my college roommates crazy playing Carter Family albums. Yes, children, there were once these things called “record albums.” They were made out of vinyl and were several times the size of a CD. We played them by torchlight as we worked on our cave paintings between wooly mammoth hunts. In fairness, my roommates could have said something. I mean, c’mon! What late 80’s college girl didn’t love scratchy acoustic country music from the 20’s and 30’s? However, one of my other two roommates made me crazy by playing the soundtrack to CATS over and over and over again. It put Andrew Lloyd Webber on the short list of people who had better not ever step out in front of my car. So, do you have music you enjoy that is fingernails on a blackboard to those around you? Or vice versa – something someone near you loves, but which you want to hurl out the window? 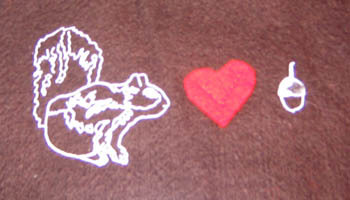 In crafty news, The Sewing Bird has now gone to 40% off everything in the store. I have successfully resisted their siren song all week. Probably being broke helped. But really! There’s still enough of individual colors of Debbie Bliss Cathay or Noro Cash Iroha or Louet Gems Topaz to make a sweater! Cathay for $4.50 a ball? Hold me back! However, it’s worth remembering that if you’re getting it cheap but you don’t need it, it’s not actually a bargain. I have no specific projects in mind that would require new yarn. And so, I stand firm. As you can see, I’ve started the leg of the socks. 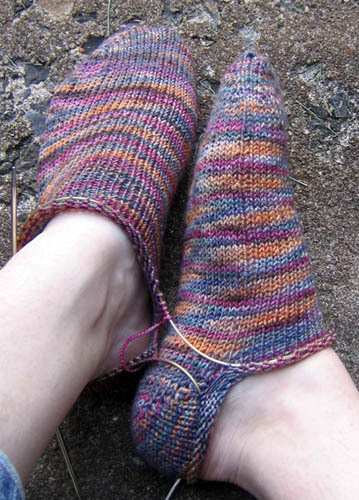 Let’s just disregard that little gappy hole there at the turn of the heel. It’s… uh… ventilation! Yeah! At any rate, a simple k2p2 rib on the leg should make for a cozy fit. I’m thinking about just working one at a time from this point on, because a) it’s getting awkward to flop both socks around, and b) Mom’s only got one sock-worthy foot at the moment anyway. Of course, by the time I’m done, she’ll no doubt be back to two good feet again. Decisions, decisions. The daughter has been very talkative and extra expressive the last few days, and told us today she wants to go to the zoo to see the kangaroos and tigers and heffalumps and woozles. We told her she’d have to settle for elephants and weasels. Regardless, we’re going to try to hit the zoo this weekend, so let’s all keep our fingers crossed for lower temperatures! And with that, I’m off to eat dinner and settle on the couch for a night of knitting and DVDs! 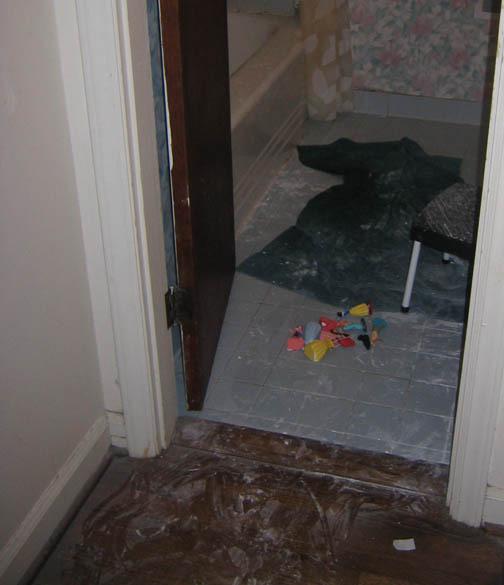 Today, among other things, I swept the hall and shook out the rug, and gave the bathroom a quick once over. Late this afternoon, I put my daughter in the bathtub and gave her a quick once over too. Then the hubby came home about a half hour early, so he watched her for the rest of her bath while I went to the grocery store. I know where this came from. One of her Disney movies, Piglet’s Big Movie, has Kanga giving Piglet a bath. After the bath, he gets sprinkled with baby powder, represented by that typical sight gag of the character being colored totally white. She apparently decided to recreate this with all of her Disney princesses. And possibly herself. Piglet also gets perfume sprayed on him, so let’s all be thankful that I don’t have any spray bottles of perfume laying around. But the fun doesn’t end there, no! 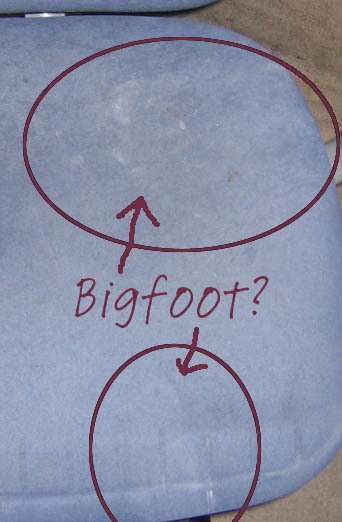 Are these little white footprints I see on my computer chair? I think they are. I’m sure it’s completely unrelated. Sweeping didn’t get it all. Maybe a swiffer will. Maybe a mop made of my husband’s thick Italian hair will. We’ll have to see. 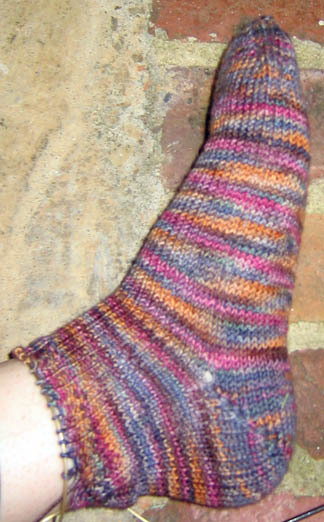 In knitting news, the heel on the Koigu socks is turned. Mom’s pleased with the fit, and I have to say, even though these are a touch small on me, they’re still pretty darned comfy. I’ve brought it in from 50 to 48 stitches. In another half inch or so, I’ll start a k2p2 ribbing. Current Jayne hat: Raleigh! Can’t stop the signal!